This was my first buddy read of 2019 with my wonderful friend Ali @ The Sunday Feeling! Make sure you visit her blog to show her version of this post some love too! We decided to pick this one up based on the eerie cover art plus it has a really good average rating on Goodreads. I can see why there are so many fantastic reviews for this one, however, I personally didn’t enjoy this one as much as I had originally hoped. Most of the way through, the pace of this book was excellent at keeping me entertained and wanting to know more. It moved quickly while not actually spanning a large amount of time. I liked the fact it was based over around 36 hours as the author managed to fit in a lot in that time. I really enjoyed the pacing of this up until the ending. Don’t get me wrong, this wasn’t by any means a slow book, but it also didn’t rush me anywhere. The ending, on the other hand, felt extremely rushed, and this was something Ali noted too, so it wasn’t me just being fussy! The conclusion rushes past so quickly that the author actually forgets to tell you the motive of the kidnapping and the history of the person who’s responsible. The person we meet seems like they could have been a very intense and interesting character to learn about but we don’t get a chance to know them before the story is wrapped up. In terms of the story in this one, it’s really nothing special compared to other police procedurals. It’s very generic and cliche – young girl gets kidnapped, the family are prominent in society, turns out the young girl had some secrets she was keeping, rookie female detective pushes hard on the case because she needs to prove herself – you know, the same old story you’ve seen a million times before. I can’t really say that the actual plot thrilled me, but it’s an easy kind of story to digest so I got through it quickly! The biggest downfall with this book, for me, was the characters, I didn’t like them, especially not our main character Keri, which is never a good sign. She’s one of those cliché detectives with her own traumatising backstory – her one specifically being that her child was abducted – so you can just imagine how seriously she takes this case of a missing child. The problem with Keri, other than being penned the same as pretty much every other female detective, is simply that she’s an awful person. I can empathise with her to an extent, but she’s rude and violent. In fact, she’s a criminal! She breaks into people’s properties without warning or warrants and she physically attacks suspects. Her partner Ray was equally cliché and turned a blind eye on his partner’s criminal activities. As for “bad cop” Hillman, who is their superior, usually, I hate these characters because all they care about is protecting themselves and they want to ‘one-up’ the rookie cop. However, this time I felt like Hillman actually spoke some sense and Keri simply disobeyed him just because she had a bee in her bonnet. He tries to suspend her because she physically assaults an underage suspect and she makes it out like he’s doing it because she’s a new detective and a woman. Does my head in. I know this is a self-published novel, but there were several grammatical and sentence errors that were quite striking that should have easily been picked up by a proof-reader. For example, in one section, Pierce is talking about Keri and then in the next sentence calls her Ashley, and then goes back to Keri. Another thing that got on my nerves was the repetition. Every time we met the tech guy Edgerton, which was about 3 or 4 times, we were told “he’s the tech guy”. Yeah, I got it the first time! There was also a few pages where the same sentence was used twice… literally the same sentence. I can’t remember exactly but the first one I noticed was the use of “she huffed out a big breath” (or something similar to that) which was written once, then there was a small conversation, and then it was used again. Overall, this was enjoyable enough to finish and I got through it thanks to its fast pacing but there were several issues I had with it which means I won’t be continuing the series. I really don’t want to get to know Keri any more than I already have, even the mystery of the kidnapping of her daughter isn’t enough to keep me interested. 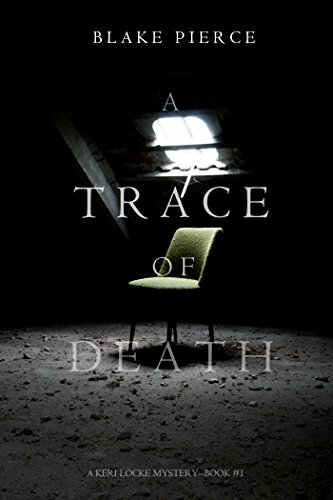 Zuky and I decided on the book ‘A Trace of Death’ after she had already downloaded a free copy and I was instantly drawn to the dark and mysterious cover. In my opinion, it was a really quick and easy read and for the most part, enjoyable. However, let’s talk about what I can only describe as the flawed characterisation. The protagonist is Keri Locke, A fairly new missing person detective who is completely out of control. She disobeys pretty much every order she is given, bends the law to suit her needs, and still manages to win everyone over. Now don’t get me wrong, I empathised with Keri after reading that her own daughter was abducted, but you can’t just swan around doing as you please to get the answers you so desperately crave, especially when you are in such a professional and respected job. After Keri had entered one too many houses without warrants, been violent towards suspects (including a minor), found the physical strength to fight men twice her size, disobeyed orders by those in higher positions and even clocked onto duty after consuming alcohol, it was almost impossible to connect to, or respect her as a character. In all honesty, I can’t say her partner Ray was much better. He made fare too many excuses for Keri and rather than protecting her by warning the police of her intentions, he simply joins her or even leads her down similar routes. I also found that whenever I read scenes involving Ashley’s father, I was left with a bad taste in my mouth. He didn’t act in the way I would expect a father of a 15-year-old too, and it was clear from beginning to end that his career was always going to come first. Worst of all, I didn’t enjoy how the book was wrapped up. It was a typical cliche police procedural ending that was extremely rushed and simply came across as messy. I found myself rolling my eyes, and was disappointed with the outcome. I also really disliked the idea of something that was mentioned at the end which I assume will happen in book 2. I have to note that there were a couple of mistakes in the text, and even though I often read ARC’s (which means I am no stranger to an error or two), one mistake, in particular, caused me a lot of confusion (which involved the author accidentally referring Keri as Ashley), and completely threw me, and all I can put this down to is the fact that it is a self-published novel. On a positive note, A Trace of Death was a fast-paced thriller that kept me entertained and excited throughout with just enough tension to keep me reading. I didn’t guess the ending (although that could have been because it was actually pretty bad), I liked the premise of the book, and it was just the right length (as I think I’d have lost even more patients with Keri had it been 50 pages longer). Part of me would like to know more about Keri’s background and am intrigued to know about her daughter’s disappearance, which is the reason I would have considered giving Keri Locke a second chance had she not been a total selfish nightmare. It was quite nice to hear that Zuky had almost identical thoughts as me, which made the discussions during our buddy read a lot more relatable. It’s a shame we didn’t pick up a 4 or 5-star book to read together but I am sure we will get to another buddy read at some point this year.